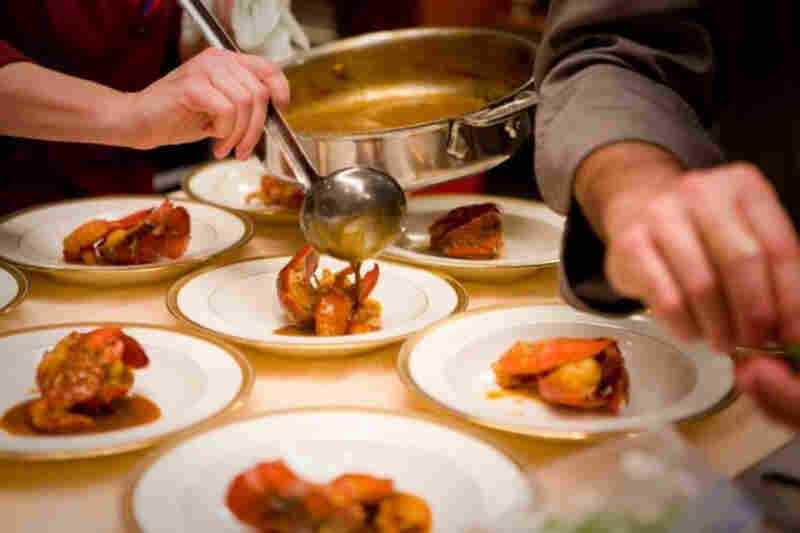 Toasting Fannie Farmer With An Epic Victorian Feast In 1896, Fannie Farmer published the best-selling cookbook of the era — and in 2007, America's Test Kitchen host Chris Kimball set out to re-create that moment in culinary history. Two years later, NPR's Renee Montagne was there for the resulting feast. Chris Kimball's wife, Adrienne, prepares the back parlor of their 1859 Victorian home for the 12-course meal featured in Fannie Farmer's Last Supper. Kimball's feast was prepared on a Victorian-era Cyrus Carpenter No. 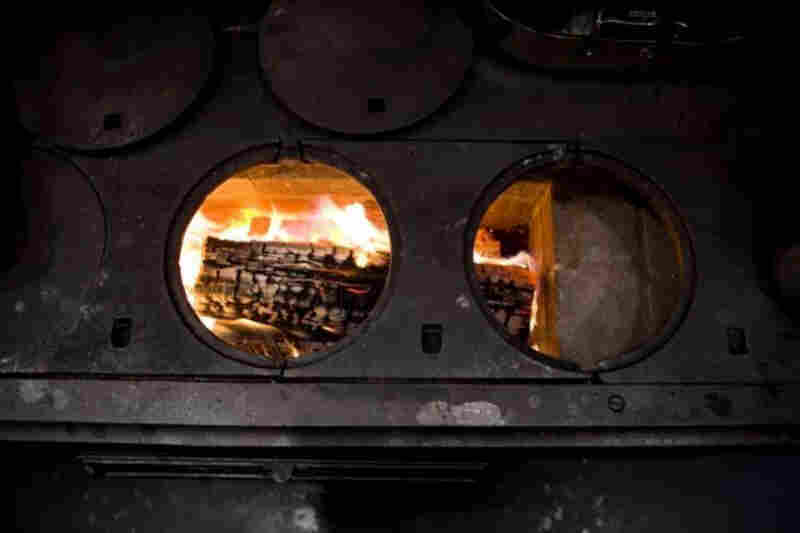 7 — the largest coal cook stove model ever made for the American market. It took almost a year to restore the stove and install it in the basement of Kimball's Boston home. 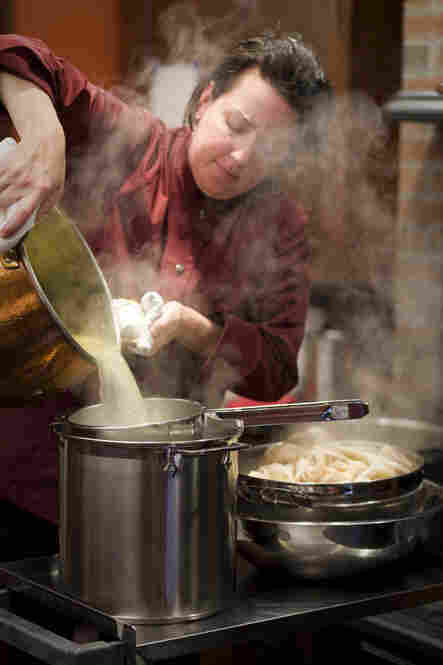 America's Test Kitchen Kitchen Director Erin McMurrer helped prepare the feast, which involved cooking stocks from scratch for dishes like Mock Turtle Soup. Kimball uses wood to fuel his stove, a common Victorian practice in the countryside where wood was plentiful and free. 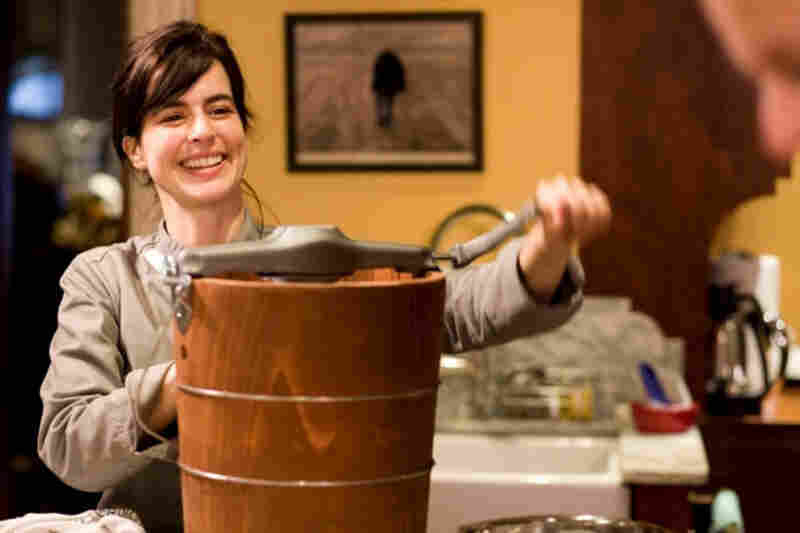 Yvonne Ruperti makes a citrus- and ginger-flavored Canton sherbet the old-fashioned way. Despite its classification as a sherbet, this frozen treat is more like an ice in that it doesn't call for milk or eggwhites. American Victorian jelly molds were commonly made from steel and rarely strayed from simple oval and circle designs. Here, a cook unmolds the Layered Lemon Jelly. 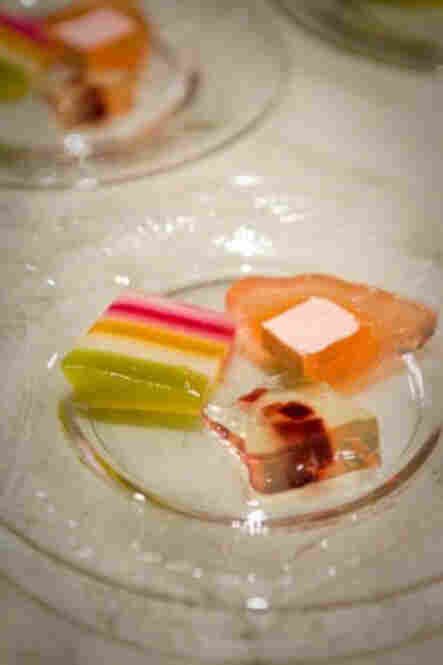 The meal featured three different Victorian jellies: Layered Lemon Jelly, Rhubarb Jelly with Strawberry Bavarian Cream and Spatlese Jelly Spiral with Cubes of Port. Only the Layered Lemon Jelly calls for calf's foot gelatin, made by boiling calves' feet. The rest call for powdered gelatin, which had become widely available by the late 1890s. According to Victorian tradition, the 12 courses included on the menu are to be served briskly, with dinner completed in less than two hours. The recipe for Lobster a l'Americaine begins with brewing a homemade fish stock from 5 pounds of white fish bones. 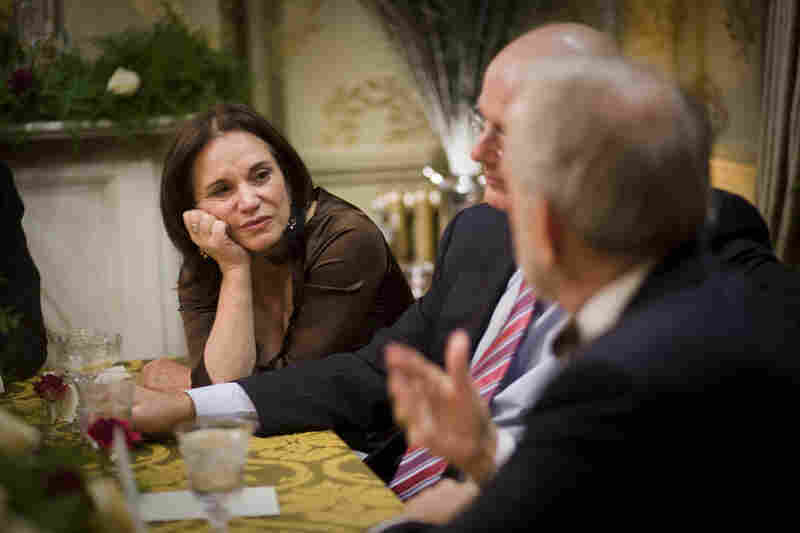 NPR's Renee Montagne was one of 10 guests invited to Kimball's Victorian dinner in Boston. Fannie Farmer's original cookbook did not include any grilled fish, but Kimball and his crew saw that other contemporary cookbooks offered grilling as an option, so they grilled their salmon on the wood-burning stove — which required 10 coats of oil to create a nonstick surface. 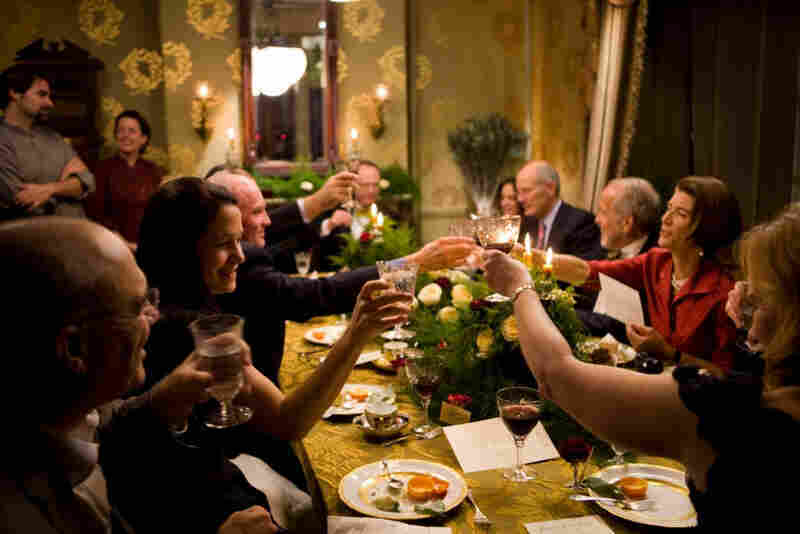 Guests, including Chicago Tribune columnist Amy Dickinson (right) and Mark Bittman (left) of The New York Times, give an after-dinner toast to the cooks. In 1896, Boston's Fannie Farmer published the best-selling cookbook of the era -- The Boston Cooking School Cook-Book. 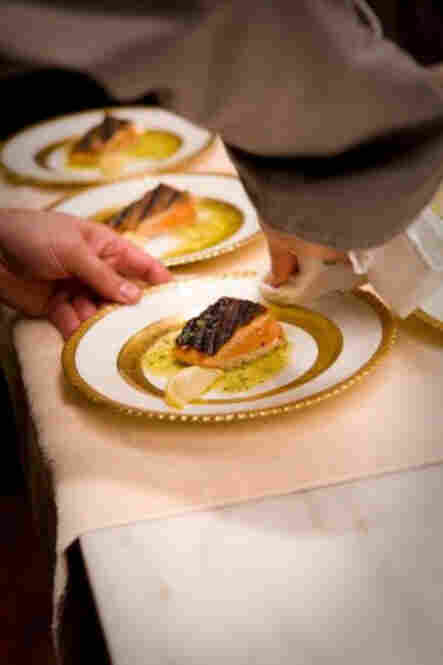 And in 2007 Chris Kimball, the host of PBS's America's Test Kitchen, set out to re-create that moment in culinary history: He would host an elaborate dinner using Victorian cooking methods outlined in Fannie's book. 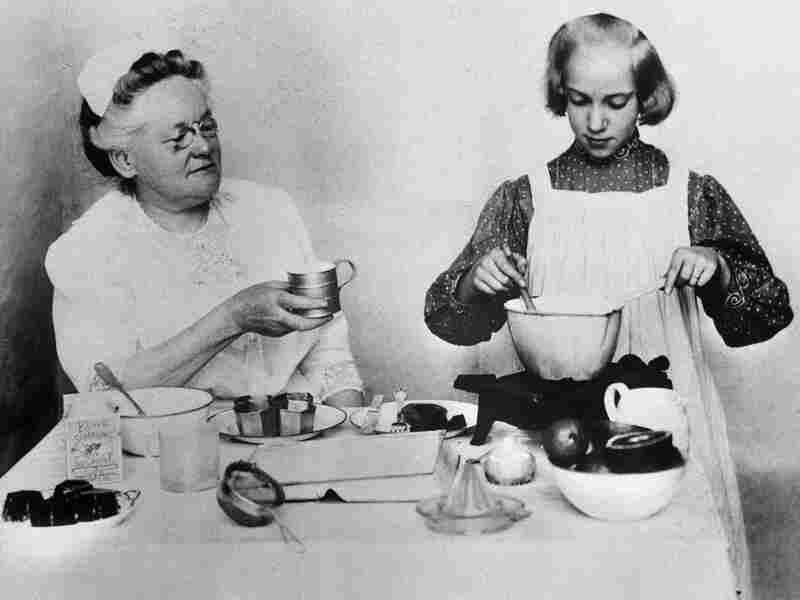 In this famous photograph, Boston Cooking School Principal Fannie Farmer (1857-1915) holds a measuring cup to a student as if to reinforce her reputation as the "Mother of Level Measurements." 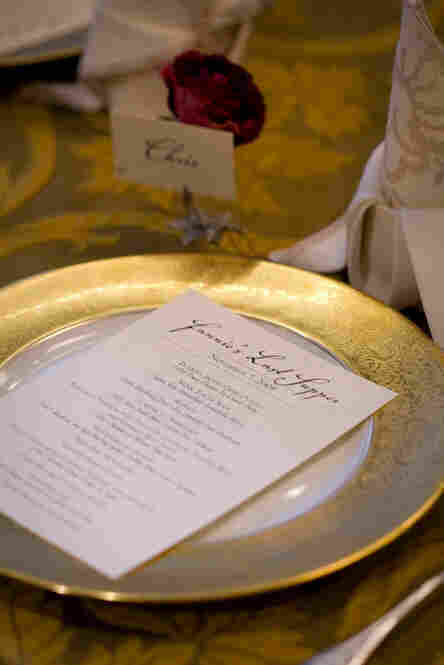 The dinner was served last November and featured satin, jewels, gold-edged china, a mermaid carved from ice and a 12-course meal. Out of it came Fannie's Last Supper, Kimball's new book that tracks the two-year process of preparing his epic meal and a documentary of the meal itself. Kimball tells NPR's Renee Montagne -- one of 10 guests at the dinner -- that his crew of chefs restricted themselves to only using cooking technology that was available during the Victorian era. 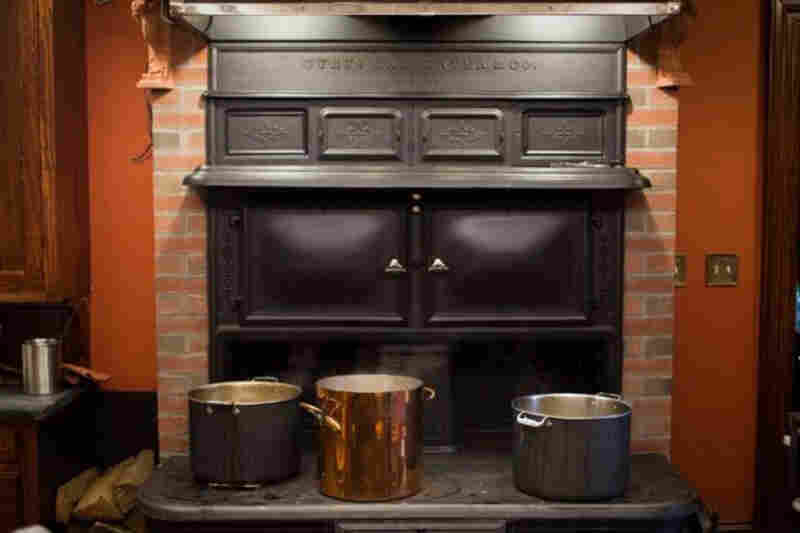 Accordingly, all 12 courses of the meal were cooked on a 67-inch stove from the 1880s. "We didn’t use modern ovens at all," Kimball says. "We might have used a mixer or a couple of things. But everything else was just knives, basic implements and the coal cook stove." And while a 12-course meal may not have been a daily occurrence in the Victorian home, Kimball says that among the middle and upper classes, it became more and more common for Thanksgiving or Christmas gatherings. "What happened toward the end of the 1800s was that people got very interested in etiquette and how you gave a dinner," Kimball says. "By getting these books and having these dinners, people felt like they were aspiring to being higher socially." He says there were rules that were strictly adhered to, like never discussing politics at dinner and never leaving tooth marks on your food. But most of all, Kimball says, "You shouldn't be hungry. You should be above hunger." But the challenges of Kimball's endeavor went beyond antiquated equipment and aristocratic behavior. Kimball is not one to shy away from culinary exploration, but he explains that Victorian recipes sometimes left a bit too much room to experiment. "In the old days, recipes weren't like they are now; they're very short. So there [were] a lot of things you needed to know that were left unsaid," Kimball says. Take, for example, Kimball's experience with Fannie Farmer's recipe for mock turtle soup. "Mock turtle soup was not made with turtle because it was expensive. They boiled a calf's head, and that gave a similar flavor," Kimball says. "What they didn't tell us the first time we did it was, 'Take out the brains!' So I boiled a calf's head with the brain in it, and I got a really thick, gloppy stock. It was awful. I finally dug up a recipe from a New York author back in the 1880s that said, 'Step 1: Take brains out.' We didn’t know that." Then there was the extreme heat emitted by the stove -- yet another obstacle to overcome. "The day before [the dinner], the fire department actually [came] because we set off the alarms," Kimball says. "Erin McMurrer, my test kitchen director, her pants actually started to melt. We, in one case, actually wrapped aluminum foil around her pants to keep the heat off of them." 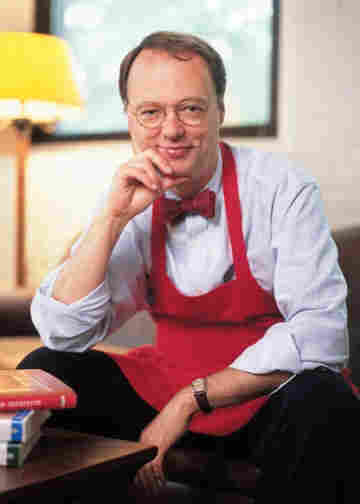 Chris Kimball founded Cook's Magazine, now known as Cook's Illustrated, in 1980 and serves as the host on public television's America's Test Kitchen. The temperature by the stove, Kimball says, was around 120 or 130 degrees, often forcing his staff to crouch down or use long utensils to cook without getting too close. And then there were the time-consuming complexities of the dishes themselves. Coloring the three Victorian jellies, for example, involved learning to make food coloring from scratch -- using spinach for green, cream for white, saffron for yellow and beets for red. Meanwhile, the jellies themselves called for far less pleasant ingredients. "These are made by boiling calves' feet," Kimball says. "You split them in half, and you simmer them for hours, and then you mix in sugar and lemon juice, and it sets up in the refrigerator when it's chilled." According to Kimball, the jellies would be just as good if they were made with powdered gelatin, as is done today. "You don’t actually have to use calves' feet," Kimball says. "But we just wanted to see if you could." Fannie's Last Supper wasn't just about the challenge, he says. The dinner was also a way for him to learn the history. "That process of cooking the food for a year-and-a-half, I learned more about 1890s and Victorians and Fannie Farmer than if I had read a thousand books on it," Kimball says. "You can't look at all the recipes in cookbooks and get the past. You just -- you have to cook it." This was a much less smelly and also an easier proposition than we had thought originally. Yes, you do need to purchase split calves' feet, but the good news is that this gelatin base can be used to thicken a great many jellies or puddings. We decided to use this gelatin in our lemon jelly but used regular powdered gelatin in the other two jelly molds. We did detect a slight aftertaste to the calves' foot gelatin, and did not want the flavor of the spatlese or rhubarb jellies to be affected. 1. Soak split calves' feet in cold water for 1 hour; drain. Transfer soaked feet to 17-quart stockpot, cover with water and bring to boil for 10 minutes; drain. Return feet to stockpot, and add sugar, lemon juice, wine and 6 quarts of water to cover. Bring to boil, and reduce heat to maintain gentle simmer; simmer for 4 hours. Remove and discard feet; skim fat; strain liquid through fine mesh strainer. Let cool to room temperature. Transfer to refrigerator; chill overnight. 2. When it firms up, remove any fat from the top, wash the surface with warm water to remove all traces of grease. Lift out jelly, without disturbing sediment at the bottom. Use per recipe for Lemon Jelly Mold. 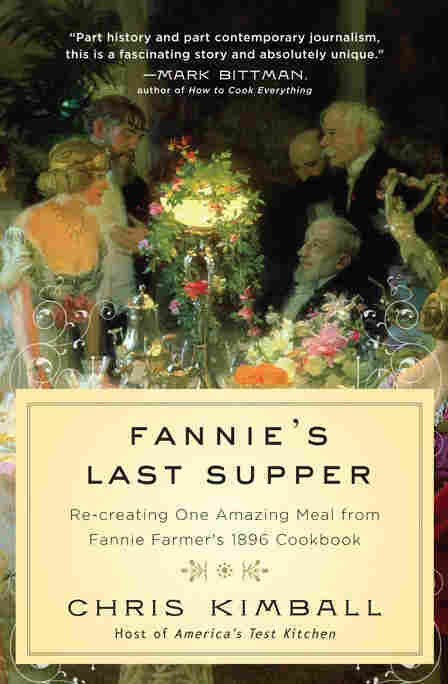 Excerpted from Fannie's Last Supper: Re-creating One Amazing Meal from Fannie Farmer's 1896 Cookbook by Chris Kimball. Copyright 2010 by Chris Kimball. Excerpted by permission of Hyperion. This is the real deal, although, by the late 19th century, few cooks were using the old method of making homemade gelatin -- powdered gelatins were readily available. Beware that different feet provide different strengths of gelatin, probably based on age. (More than you needed to know, I am sure.) In any case, it is worth testing the strength of your homemade gelatin before going ahead and using the recipe below. 1. In a medium saucepan, melt the gelatin over low heat until it is liquid. Remove from heat. In a separate saucepan, combine the lemon juice, water and sugar and cook over medium heat, stirring occasionally, until sugar is melted. Combine the lemon syrup and the melted gelatin and pass the mixture through a jelly bag until clear or until no sieved material remains in the bag. 2. Divide the gelatin into separate bowls and color as desired. Pour into chilled jelly mold. Let each layer set completely before adding the next. The "mock" in Mock Turtle Soup is a calf's head that is simmered to make a stock for the soup. Be sure to remove the brains first (and the eyeballs), and have the head cut into pieces. Preferably, this is done by your butcher, not at home. (Eyeballs are firmly attached -- they won't just pop out!) The recipe for Brain Balls can be found at www.fannieslastsupper.com. 1. Split calf's head in half, remove the brains (reserve for the following Crispy Brain Ball recipe) and eyes (discard), cut out the tongue, and clean well, including the nostrils. Cut the head into pieces, soak for one hour in 20-quart stockpot in slightly salted water. 2. Drain, cover with 6 quarts cold water along with the wine, ham hock, beef, bay leaves, cloves, allspice berries, peppercorns, onions, carrots and celery, garlic, and herbs. Simmer for 3 to 4 hours, or until the head meat is tender, skimming foam as necessary. 3. Transfer bones, meat and vegetable to colander set in large bowl. Pour broth through fine mesh strainer (adding any liquid given off through colander), let sit for 10 minutes and skim off fat; use as needed (or cool quickly to room temperature; refrigerate until needed, removing fat from top before using). Yields about 4 quarts. Reserve the meat from the head along with the ham hock and tongue; shred into small pieces; this should yield about 3 cups. Discard pieces of beef round. 1. Heat butter in large heavy-bottomed saucepan over medium heat; when foaming subsides, add onions and sage and cook, stirring frequently, until softened, about 8 to 12 minutes. Add flour and cook for 1 to 2 minutes. Whisking constantly, gradually add broth; bring to boil, skimming off any foam that forms on surface. Reduce heat to medium-low, add bay leaf, partially cover, and simmer, stirring occasionally, until flavors meld, about 20 to 25 minutes. Strain through fine-mesh strainer. Season to taste. 2. Blanch julienned vegetables in 3 quarts seasoned stock, for 1 to 2 minutes. Shock in ice water. Reserve. 3. To serve: Reheat soup base; finish with sherry. Cook Brain Balls (see recipe link above). To each bowl add equal portions of room temperature vegetables and 1 to 2 tablespoons pulled meat. Pour hot soup over garnish. Finish with 2 to 3 Brain Balls per serving and chopped chives.